Today’s Nice Price or Crack Pipe Bimmer is 11 years old, but has required over $10K in maintenance in the last two of those. That makes it either a money pit or future proofed. Let’s see what its price adds to the mix. There were some dents plaguing last Friday’s 2005 Mazda 6 wagon. The interior had some issues as well. Neither exterior nor interior challenges proved all that challenging at the car’s modest $2,499 price, especially when there was a rare manual gearbox involved. In the end, that 6 earned itself a solid 85 percent Nice Price win, warts and all. There don’t seem to be any warts on today’s 2008 BMW 135i. In fact, the car, while over a decade old, looks to be in near-new condition. That ship-like shape is owed, according to the seller, to a life spent in the garage when not out exercising its twin-turbo mill. In a rare instance in the 135i, that work is shared with the driver as this E87 comes with three pedals in the footwell and a sweet ZF-sourced 6-speed stick between the seats. BMW has been the longest holdout in switching their smallest cars from RWD to a more space-efficient FWD format. Pretty much every other major car maker has made the move, but for the longest time BMW has been resolute in demanding all of their small sedans and coupes be RWD. That’s not going to be the exclusive case much longer, but like Bogey had Paris, we still have the little 1-Series to remind us what a good RWD small car feels like. Well, I guess there’s the Miata too, but we’re not talking about those right now. Stay with me here. The E87 shared a majority of its under-stuff with the E90 3-series, just in a slightly smaller, albeit not that much lighter form. The engine in this ’08 is BMW’s N54 DOHC straight six, a mill that sports not just one but two turbos. In the 135i that pumps out a healthy 300 horsepower and can catapult the car from zero to sixty in a respectable 4.7 seconds. With its standard M-sport suspension and big brakes, it should be able to handle and stop just as impressively. This one has apparently had some impressive, and expensive, work done. The seller claims that ten thousand dollars have been dropped on the car in the past two years. That was spent on work that included new turbos, a new cylinder head and all the related might-as-well-since-we’re-in-here bits. Not only that, but the ad says that the A/C was replaced within the last six months. I’m not sure, but I think this car’s engine bay may be cursed. The wear and tear isn’t from excessive miles. There’s only 86,000 on the clock. That’s way below average and a bit of a shame considering how much fun these cars are to point and shoot. Regardless of past problems, the seller says the car now “drives excellent and will last for many years as all required and preventive maintenance have been performed.” An aftermarket intake dresses up the bay too, and probably makes some louder noises when you dip a toe into it. On top of all that, there’s the stick shift to consider. If you look at the 135i market right now, it’s full of automatics. 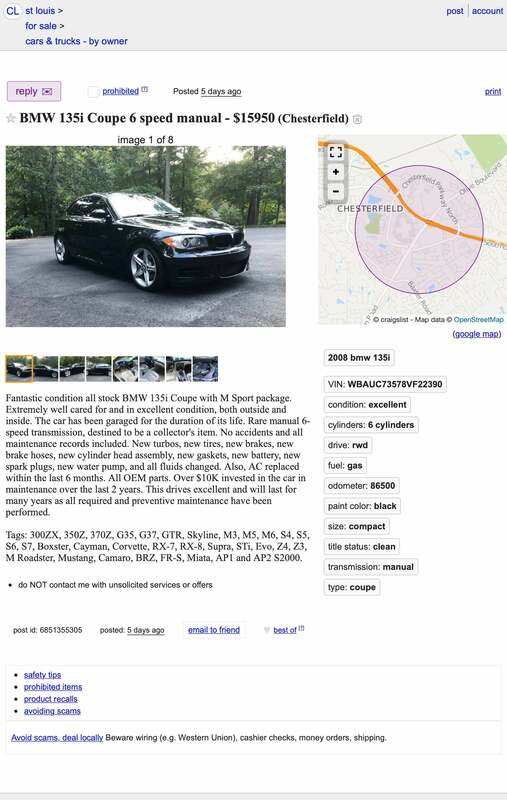 In fact, this ’08 seems to be the only one with a stick on Craigslist right now. I know that all cars will eventually be automatic—hell, they’ll all be electric and probably not need transmissions before too long—but it’s nice to know that we can still get a compelling package that allows for row-yer-ownage. What might you pay for that opportunity? The asking price for this uniquely kitted black on taupe edition is $15,950. That gets you all the work done, the clean overall appearance, aftermarket intake, and a clear title too. The question is, could it all be worth that? 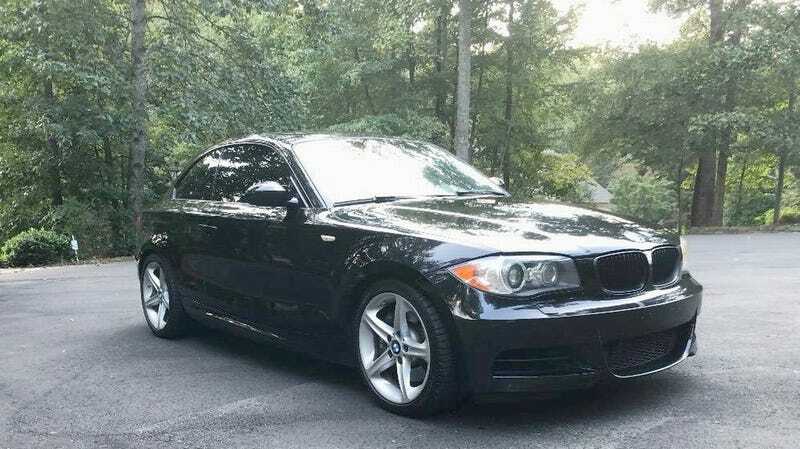 What do you think, could this manual 135i command that $15,950 as presented? Or, is that too much considering its history as well as its present? St Louis, MO Craigslist, or go here if the ad disappears. At $2,499, Could This Dimpled 2005 Mazda 6 Wagon Put a Dent in Your Wallet? For $3,750, Could This 1996 BMW 318ti Hatch A Deal?